Rent Receipt template is very high in demands for business and other purposes. Real estate dealings are extremely frequent and the maintenance of an authentic record is a must for both the resident and the owner. It is demanded and advised to the renters that they should have printed proof of the receipt in terms of a document. Such receipts are your only hope in case of any kind of misunderstanding. A rent receipt is a professionally used document which is used by the landlords to document the payments related to rent. Although the rent receipt is issued by the landlord, it is equally useful for the tenant. What is the purpose of using the rent receipt? The rent receipt is used to protect the rights of both the tenant and the landlord. This receipt is used as evidence that the payment has been paid by the tenant on a specific date as requested by the landlord. The Landlords use the rent receipts when they want to keep track of the incoming cash. The landlord can also easily monitor the late payments with the help of rent receipt. For a tenant, the rent receipt is a written proof that the transaction of rental payment between the tenant and landlord has been completed successfully. For a variety of reasons, tenants and landlords are advised to keep the copy of rent receipt with them. Worse case scenarios are possible such as a forceful takeover by the tenant or if the owner decides to pull an illegitimate case on the renter in order to force them to leave. Such events can be avoided by assuring a formal record of each and every step and the rent receipt is an integral part of such records. What information is included in the rent receipt? With the help of rent receipts, the landlord can know whether the tenant has made full payment or partial. If the landlord wants to add additional charges to the rental payment because of late transaction, he can mention it in the rent receipts. In this way, if there is payment which is overdue, the landlord will be able to track it easily. 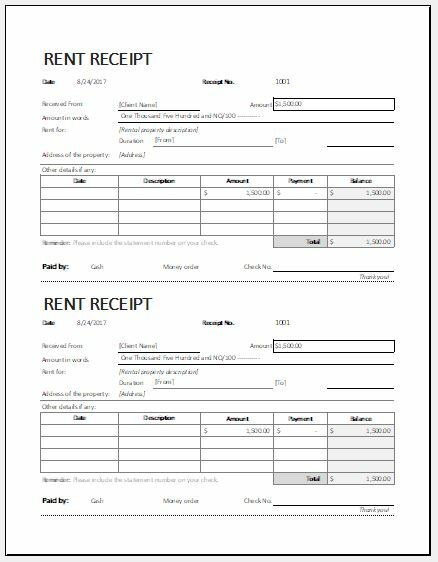 Rent receipt template is a readymade receipt that is intended to save the landlord from having the make the rent receipt from scratch. This template enables the landlord to track the payment received from the tenant. If there are multiple properties and the landlord has to deal with multiple tenants, the rent receipts for all the tenants can be made easily. The given receipt template allows you to easily fill out the details required and assures you a formal and legal record of the payment for both the tenant and the renter. The template allows you to quickly create professional looking receipts that are easy to understand and can be filled out by anyone. The templates can be used through the simplest of software of Microsoft Office such as Microsoft Word 2007. Older versions are also compatible with the template and can easily run it. This helps users of all sorts to make use of the sample said template. 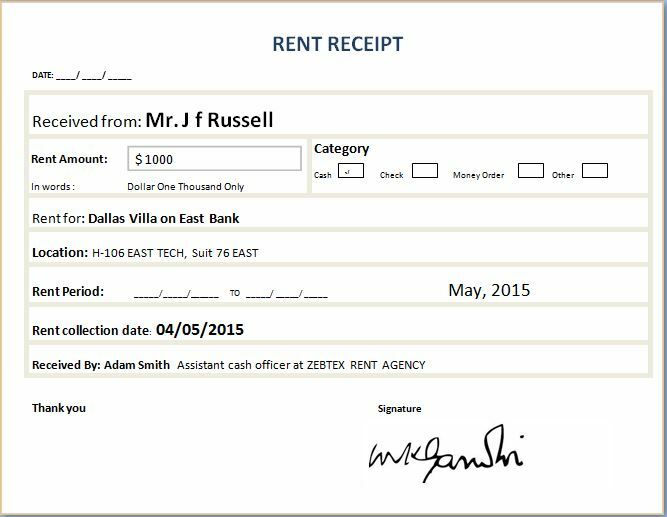 The rent receipt template can be downloaded from the internet. It can very easily be edited according to your requirements.